The sunnies were last worn here, dress here, boots here and bag here. This is the first time I've worn the cardi on the blog. I was hunting through my wardrobe earlier in the week looking for a particular black top - that I decided not to wear anyway once I found it - and came across this top. I really love the colours and print on it, but I haven't worn it much, which is a shame. Last time I wore it was January 2011. It's crazy that I can let such a pretty top go unworn for over 2 years, and that I have enough clothes in my wardrobe to allow that to happen!!! The jeans were last worn here, shoes here and bag here. This is the first wearing of the top on the blog. the belted cardigan looks chic! and i like your bag! Wow! that cardi is amazing, love its shape!! and the floral blouse is so sweet :) nice outfits! Great look and color on you. That cardi is really versatile! The belted cardi really accents your tiny waist! You look lovely! I really like the alexa - but I've never tried the del ray to compare the two! Love all the looks! You look absolutely adorable! I love the belted cardigan! That's one I've been meaning to try too. That pale pink bag in the second outfit is adorable, and I love that top! i love your bag from first look! beautiful color! you have a lovely style:) great job! how could I not love this! The color of that blue bag is awesome! I love it! wow that draped cardi looks stunning on you! Cute outfit. I love that Alexa bag. Looks great in grey. 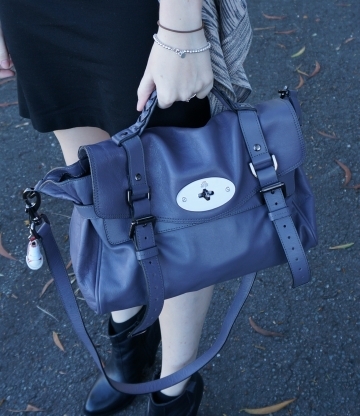 Absolutely love the mulberry bag- and it's such a unique color too!! Thanks for sharing your blog and fabulous outfits! very flattering silhouette in your thursday outfit :) love the bag as well! Thanks for visiting my blog and leaving your nice comment! I love the layered cardi look, it's such an amazing combination! How strange has the QLD weather been of late? It makes me so sartorially indecisive haha! I know what you mean! The heat and the rain is just so random - never know what the day is going to turn out like! the first one is definitely one of my fave outfit of yours!! !I love the way you have put together the whole ensemble! Your color scheming is simply fabulous! I love that blue Alexa, very different and more fun than the usual beige. Love both outfits! ;) The grey cardigan is amazing! that blush pink mbmj is absolutely gorgeous.. goes so well with the rest of your outfit! the belted cardi works so well - great way to give a look a bit of shape! I wish I had an Alexa! I really like the belted cardi look! Looks great with the dress! Great colours on casual Friday too! I love your pretty waterfall cardigan in the first outfit, looks great with the belt! Loving your black boots with the black dress - so pretty! Lovely outfits! I love your top on the second outfit, such a beautiful color! The first outfit has such a melancholy feel, and the second one is so autumny! You look great in either of them! aw love these looks- simple but perfect just what I like !!! mica, that striped draped cardi looks so awesome with your outfit! i love how you belted it. tres chic!!! 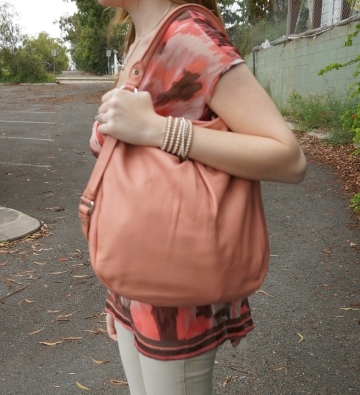 fabulous pink hobo & florals on you. I think I need more cardigans! I was at the store today and wanted some dresses... but realized I also need some cardigans to go with. I love your working style@!! so casual yet profesional! I love the colorful bags!